This is the Gallery of Rhett Kelley. Let's start with a classic design that will be familiar to everyone here. 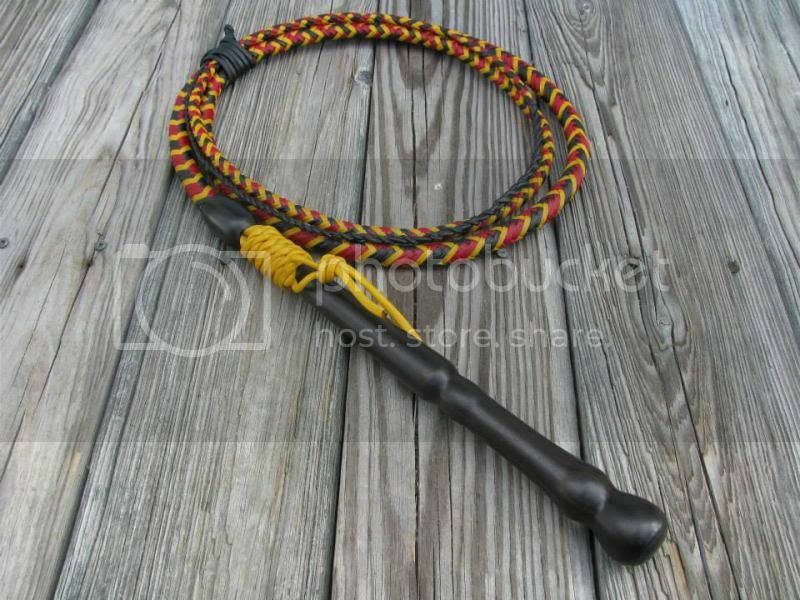 This is a 9ft coral snake with an Indian ebony handle. The coral snake design in various configurations is probably one of the most popular I make. 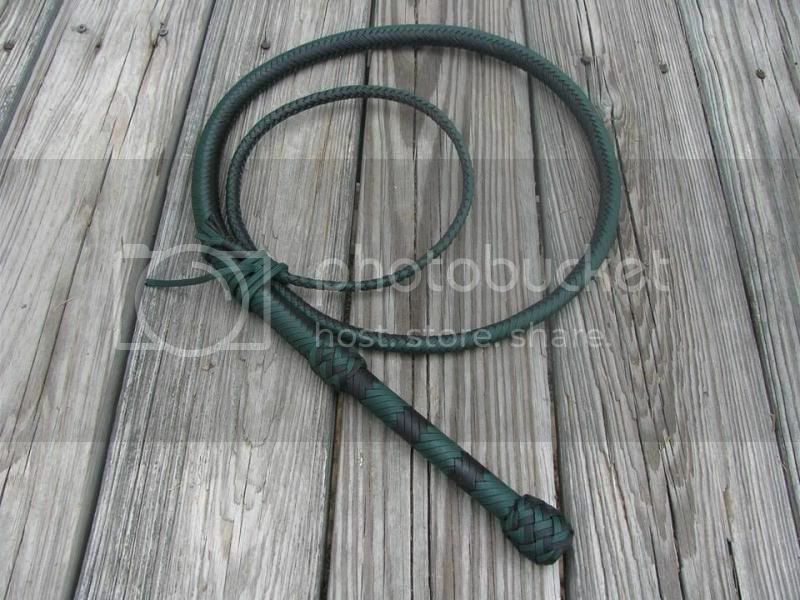 This whip now resides in Florida and is used by a gentleman who uses it for doing shows at local schools and churches. I did the tie-on laces in yellow on this one just to see how it would look. All this are amazing! 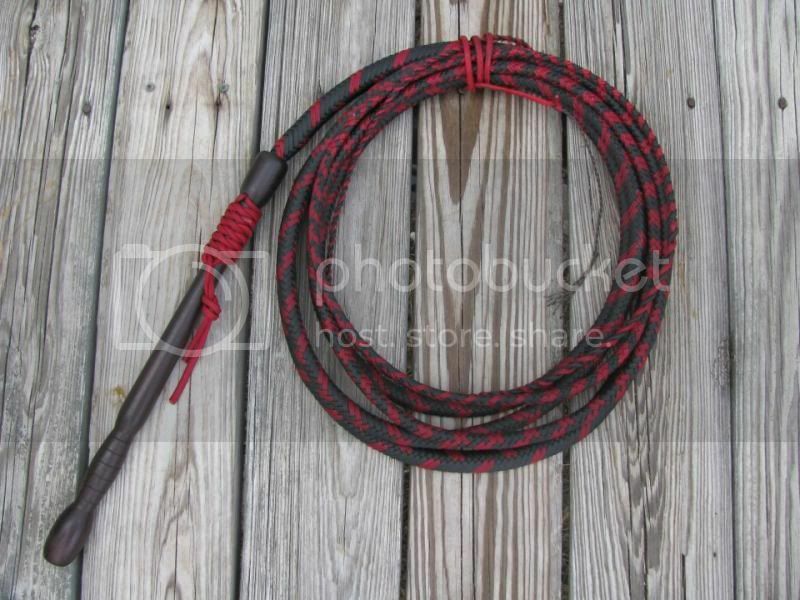 At first I thought the ebony whip was the one that I have, but then realized that it is much longer than mine. So glad you got the glitches all sorted out. Thanks Bobbi! Using Photobucket seemed to be the cure. It must've been one of my site's security plug-ins causing it when linking to pics there. 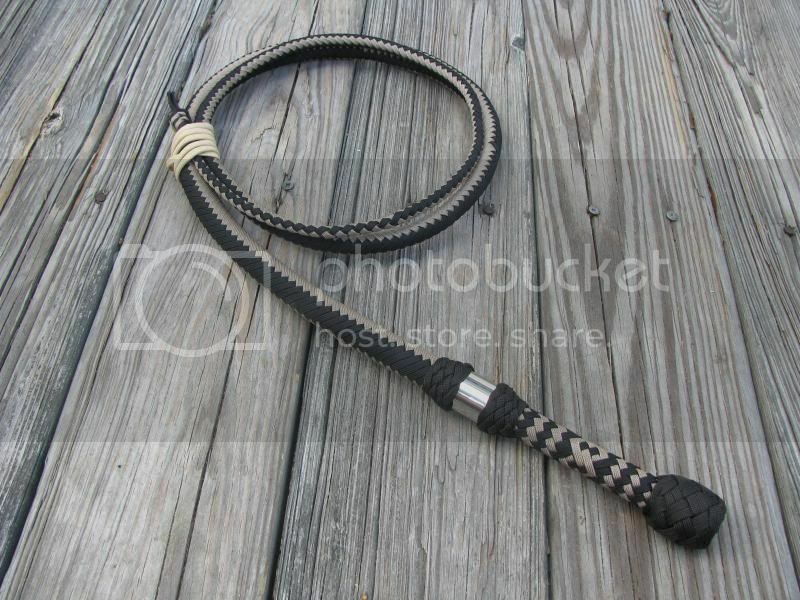 Snakewhips aren't my biggest seller, but they've recently started selling better. This is a 7 footer I like. 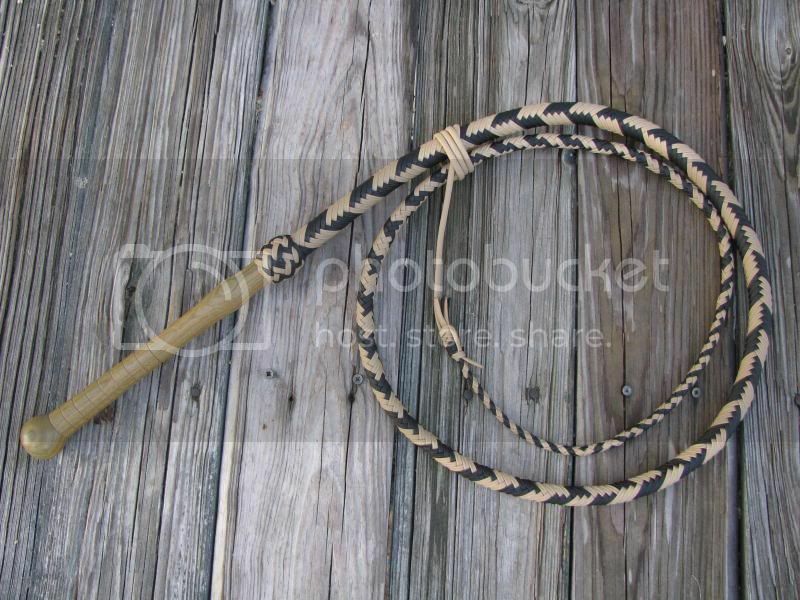 After so many whips, it starts to become a blur, but I think this one is now in Utah being used on a ranch. 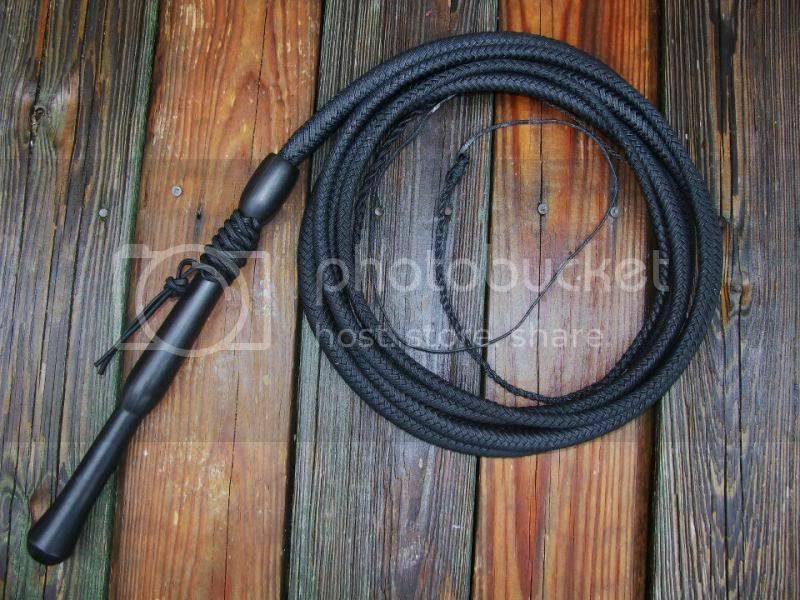 6ft, 16 plait bullwhip. 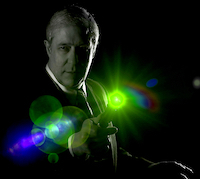 Just having a little fun with the grip on this one. I liked how it turned out. 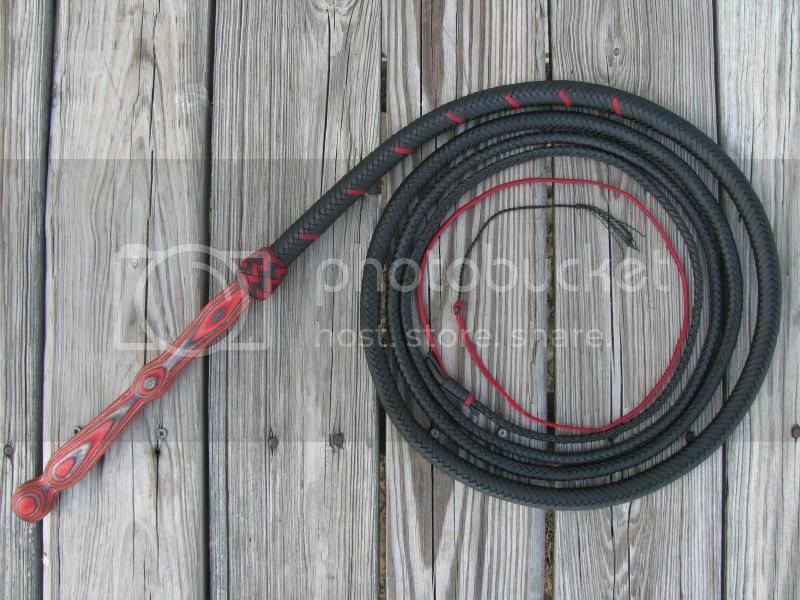 This 6ft 12 plait bullwhip is used on stage by The Flaunt Girls at the Sturgis motorcycle rally in South Dakota, and when they perform elsewhere. 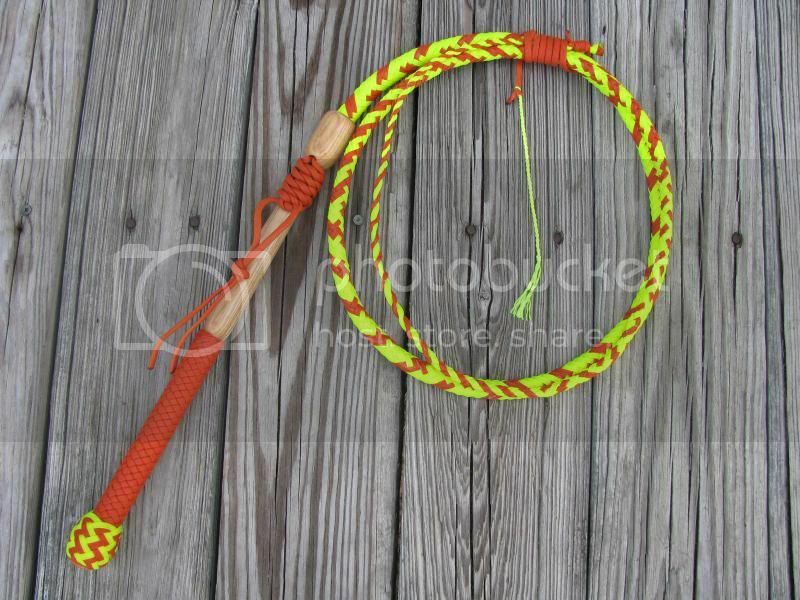 The first whip they bought from me was similar, but agents from our glorious TSA "stole" it at the airport when it was accidentally packed in their carry-on luggage. 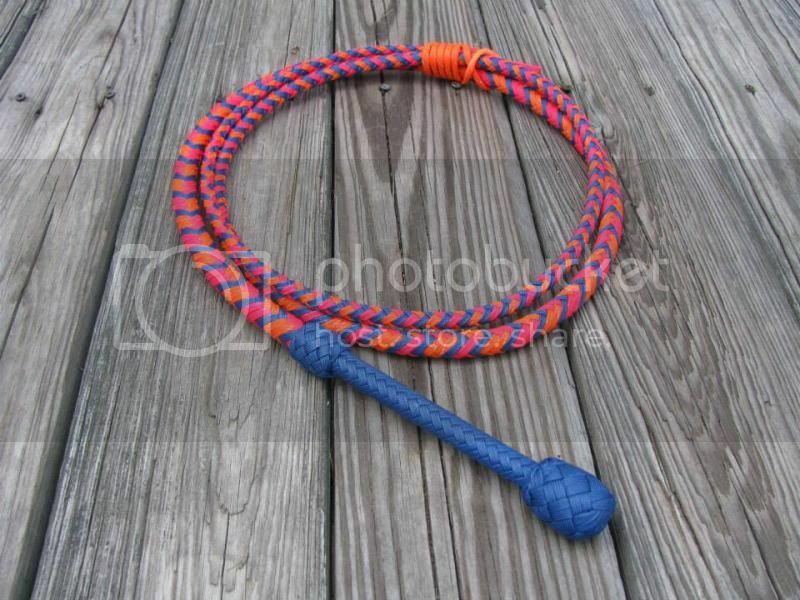 A really bright 12 plait bullwhip. It has neon pink, royal blue, and neon orange (w/ reflective tracer). This one is now in Japan. This woody bull is tan and black on Argentine Lignum Vitae, one of my favorite woods to turn. 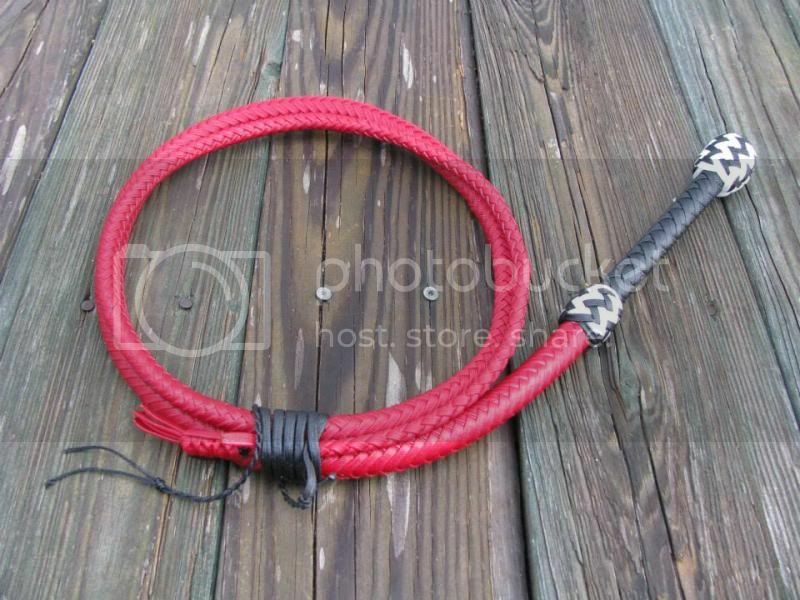 I finished this one a few days ago, is a 16 plait bullwhip with some fancy work and a shiny collar. beautiful work Rhett my complements! The last one - 16 plait with collar - is definitely my favorite! Looks compact and elegant the same time. The pattern on the handle is very nice! Is it a 5 Footer? The handle is a laminate called stratabond/colorwood. The thong is actually 17 plait at the start so I could sneak in the single red strand Ric wanted to run for the first foot off of the handle. It was a challenging build. And to top it off, he also had me build a shorter version that looks like a smaller twin after this. All great looking whips. I like the dark wood handles. For the 20'er do you bundle the strands or just untangle as you go? Either way it is a lot of cord to start with. Thank you sir. I just untangle it. 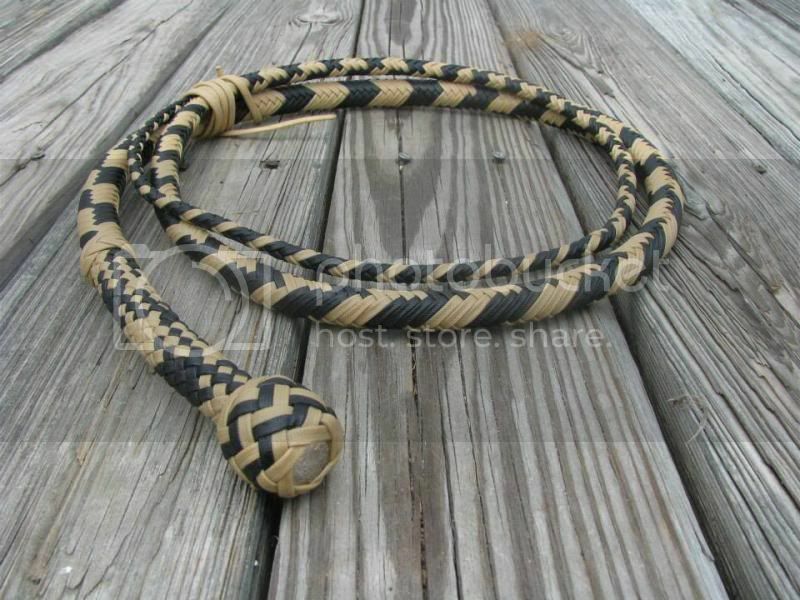 It's a lot of cord, but I started out making longer whips, so I'm sort of accustomed to working with it. I've found pulling one strand at a time from the mess in a straight upwards motion from the floor will allow me to untangle it fairly quickly. Sometimes you'll get a little knot down at the end of one of the strands that will cause a snag, but it's pretty easy. 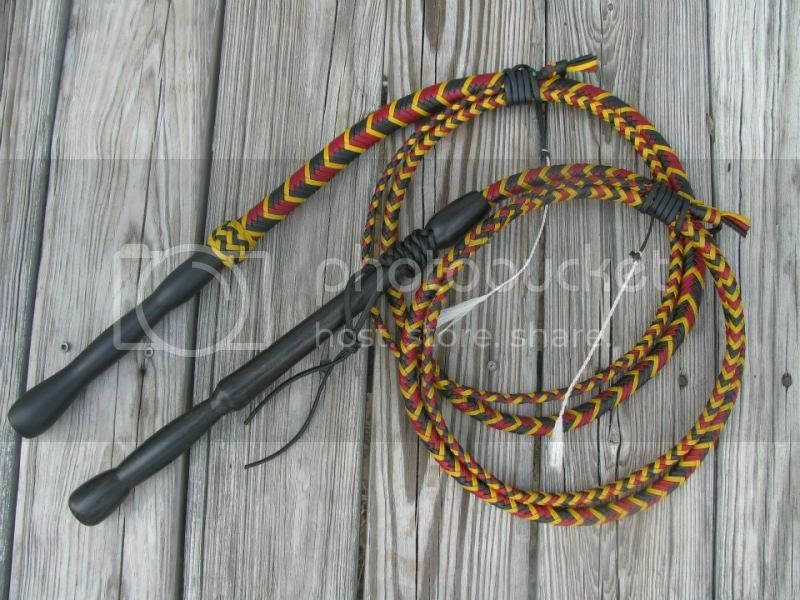 This 12 plait bullwhip was made for a young man who really likes snakes. This color pattern was meant to resemble a photo he sent me of a "Blue Coral Snake." 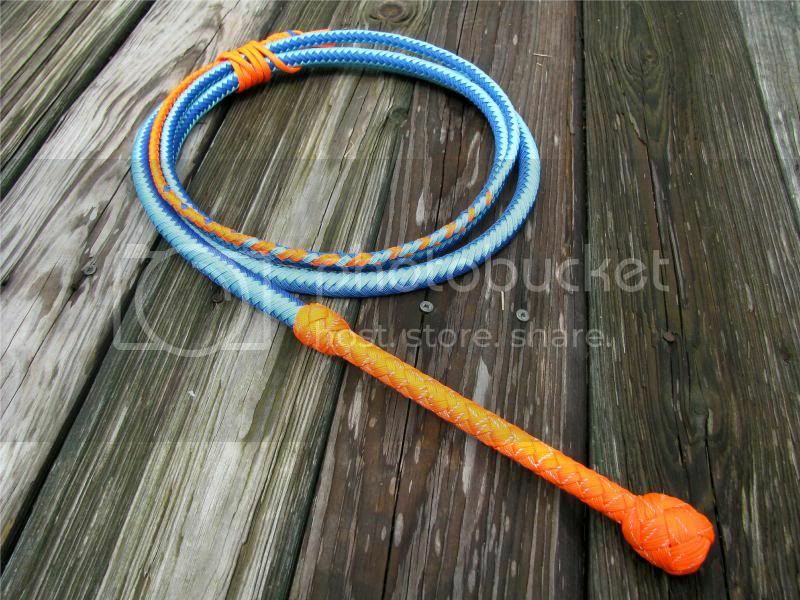 It's blue and turquoise with the handle and point in neon orange with reflective tracer.